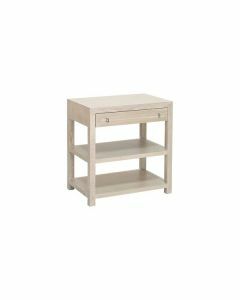 This grey cerused oak side table features one drawer with acrylic and nickel hardware. The table measures 28’’W x 29’’H x 18’’D. Ships via motor freight. Click image for greater detail. Please note that we can order any item from this vendor, please contact us if there is something you need that you don't see on our website.